Hi, kiddos! How’s it going? I know it’s been a while but a lot has been going on. Like Spring FINALLY coming to the polar arctic (yay!). And in the past 12 days, I have finished my thesis (all 68 pages of it), took an exam, gave E my camera, finished my comps exams, forgot to get my camera back, got matched to my Dietetic Internship program, went food shopping, took E food shopping, wrote part of a paper, and ate… a lot. But that doesn’t mean that my eating suffered! Like I have stated before in the blog, cooking and baking are very relaxing for me. In the world of stacks of thesis literature, Medical Nutrition Therapy PowerPoint slides, and endless post-it notes, taking an hour out of the day to make dinner is a real treat. One of my dinners this week was a real jump out of my comfort-zone. I dislike cheese very much (except for fresh mozzarella and cheese on pizza! ), but I decided to try my hand at making farro risotto. Risotto is an Italian dish that consist of cooking Arborio rice over a low heat while slowly adding in stock. The end result is a creamy texture that melts in your mouth – with the addition of a good helping of Parmesan cheese (ick!). But since I decided that my Lenten journey would be one of adventure and courage, I decided that I should take a risk. 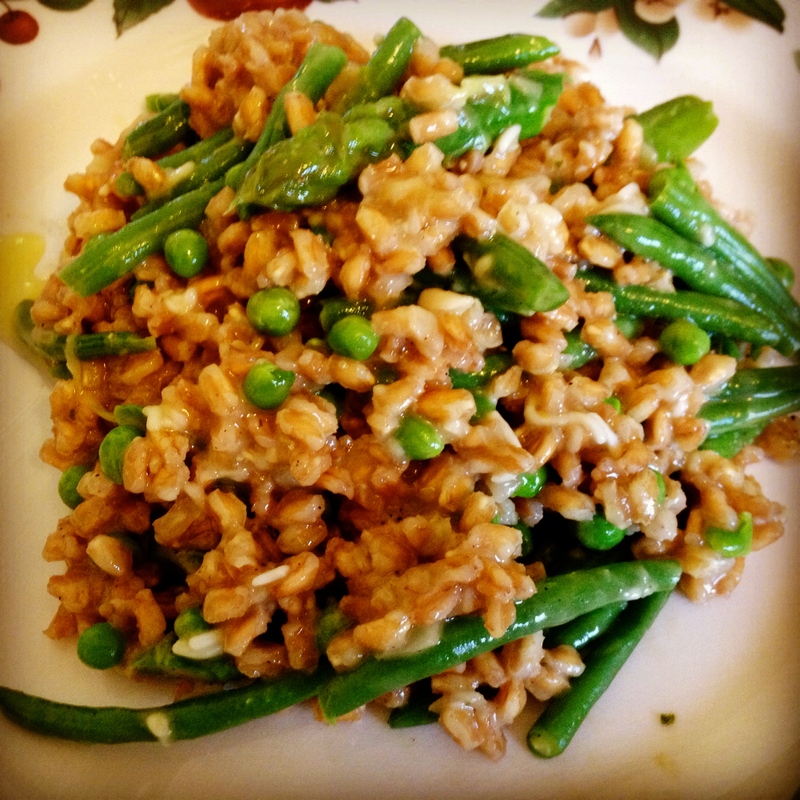 And using farro instead of Arborio rice gave the dish the added protein I needed. The other dinner of note from these past two weeks were zucchini-falafel fritters and spanakorizo. Check out the blog tomorrow for a full recap on how to make this utterly delectable meal! Finally, my week held something sweet! This is the amazing cake E made me for Match Day! I have to admit that I started to cry when I saw it. It was such a sweet gesture and really meant the world to me! RD2Be Forever (at least for the next 18 months…)! I hope you all had a wonderful past two weeks! I’ve missed you! !